I really was trying to cling on to the last bits of Summer, but the weather is changing and it is almost officially Fall. 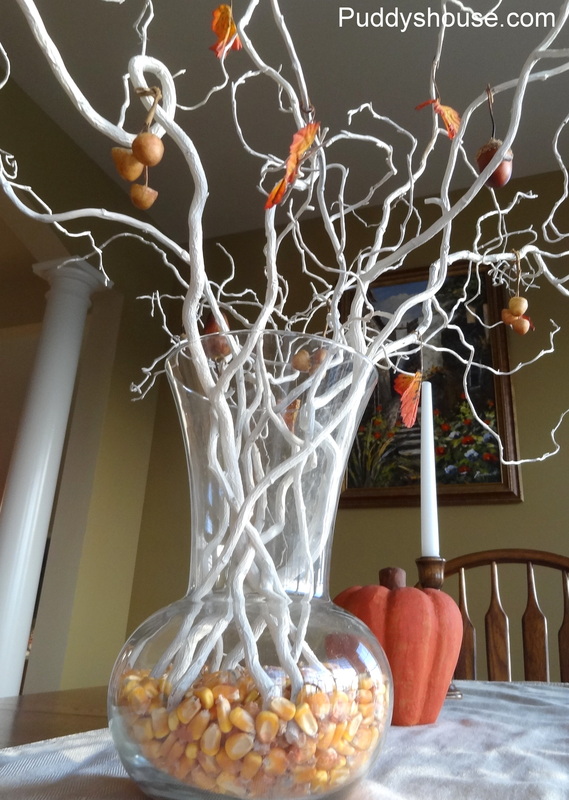 Plus, blogland has become filled with Fall decorating ideas, so I thought I should begin to decorate our house as well. The leaves really haven’t started to change here yet, and I haven’t gone out searching for pumpkins and gourds yet….although I did pass a farm stand that was new to me in my work travels today, so I may have to go back there. But, since nature has not helped me yet in my decorating, I started to work with what I already had. I had picked up a few new to me Fall items at yard sales this summer, so I did have some different decor to work into what I have used in the past. 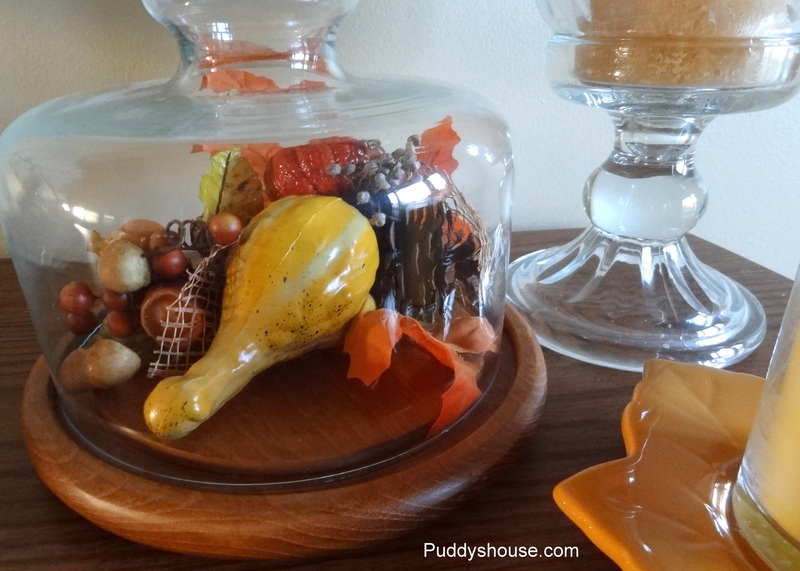 When I pulled out all my Fall decor and supplies, I found several picks that I had yet to do anything with. So, I took the easiest route first and just put them under glass to see what I thought, and it worked for me. I added the leaf holding a candle, a recent yard sale find, and the large candleholder which I stole from my everyday decor in the basement. I knew I needed something else with height and none of my other Fall items were tall. I remembered I had some Fall themed scrapbook paper that I had forever and never used, so I pulled that out and popped it into one of the random frames from my closet. I added some ceramic pumpkins and called it a day….well, after I moved them all around several times and waited until this morning to decide that it would work for me. 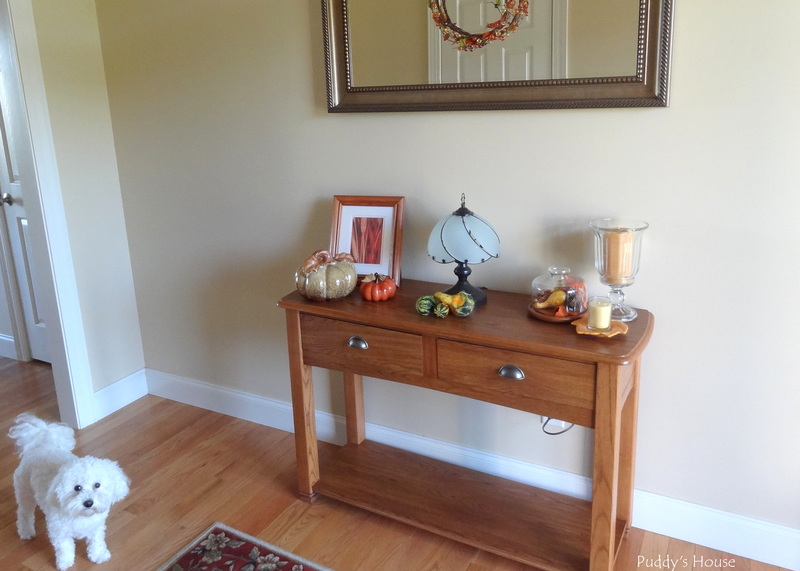 Its not as beautiful and detailed as some Fall decorating I’ve seen, but its simple and seasonal, so I think our foyer now is ready for Fall. I also worked on changing up the dining room table centerpiece as well. The centerpiece had been the same, for the most part since Easter! Before Easter I had collected some willow branches on a walk during my lunch one day knowing that I wanted to spray paint them and put them in a vase. I did just that, and then for Easter I hung colored eggs from the branches and put it between some candlesticks and on top of a colorful runner. After Easter, all I did was remove the eggs and it stayed like that through the Summer. I decided to keep the same structure and just update it for Fall. I pulled out our neutral tablerunner, took the branches and rocks out of the vase. I replaced the rocks with corn and put the branches back in the vase. Then, I used more of the picks I had on hand from yard sales and ripped them apart. I used the leaves and acorns from the picks and their individual wires to hang them on the branches. 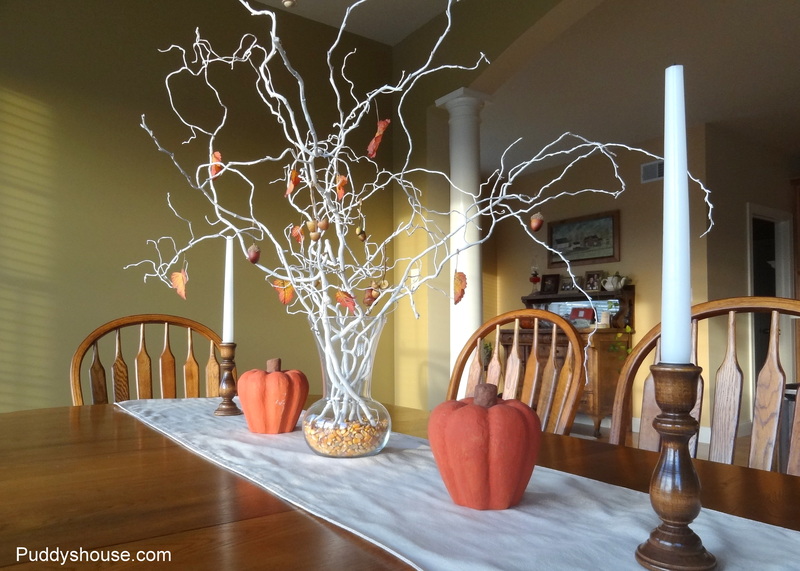 I added two painted craft pumpkins and swapped the white candlesticks for wooden ones to give me a simple Fall tablescape. I did add a few other Fall touches to the house, but I’m sure I will add more once I can bring some pumpkins and gourds home. Anyone else work with what they have to decorate for Fall this year? Lovin’ that darling Fall tree on your kitchen table.